A uniform early-established canola stand of five to eight plants per square foot usually yields better than thinner, later or uneven stands. In a meta-analysis of more recent Western Canadian studies on hybrid canola, Murray Hartman, oilseeds specialist with Alberta Agriculture, found that, overall, hybrid canola achieved 95 per cent of its yield potential with six to eight plants per square foot, 90 per cent of its yield potential with three to four plants per square foot and 85 per cent at two to three plants per square foot. Fewer plants than that and yield potential can drop dramatically. A target of five to eight plants per square foot allows for the loss of a couple of plants to frost, insects or other establishment threats while maintaining yield potential. This seeding rate is extra insurance to reduce risk. 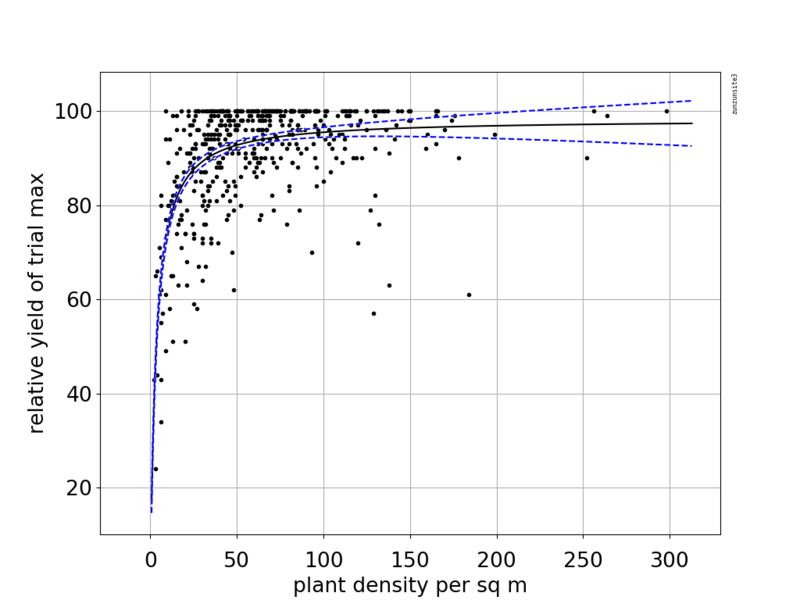 This target density range is also wide enough to allow for some uncertainty due to emergence percentage and seed size variations within a seed lot. Here are the economic considerations for five to eight versus two to three plants per square foot. Seed cost. Assuming 60 per cent seed survival, 5g/1,000 seed size and $12 per pound seed cost, seeding to target five to eight plants per square will cost $48.00 to $76.80 per acre. With the same parameters, seeding to target two to three plants per square foot will cost $19.20 to $28.80 per acre. The difference between mid-points of the two targets would be around $35 to $40 per acre. Try to think beyond the immediate seed savings and remember that extra plants = extra insurance. 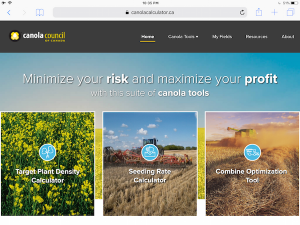 Use the Canola Calculator to run your own numbers. Yield. If the higher target achieves six plants per square foot, meta-analyses show it will achieve 95 per cent of its yield potential. (See the graph.) If the lower target achieves three plants per square foot, this will achieve 85 to 90 of its yield potential. While a lower stand can sometimes yield as much as a more dense stand, meta-analysis averages suggest the lower and more variable yield potential for the lower target basically wipes out the seed cost savings. Lower plant stands also face other subjective factors that can reduce the profit or increase risk or both. These are subjective because they are based on varying circumstances and the true cost is harder to calculate. The following discussion is for guideline purposes only, but the dollar figures will give you a starting point for your own calculations. Non-uniform establishment. With fewer plants in a stand, the risk of dropping below two plants per square foot in patches (such as hilltops, for example) becomes much higher. Non-uniformity can result from seeding errors, variation in soil temperature, type or moisture, early season insect feeding, frost and more. In areas below two plants per square foot, yield potential is extremely variable (only 60 to 80 percent of full yield potential or a 20 to 40 percent average yield loss). If 10 per cent of a 160-acre field is below this threshold, you could be shaving off at least 1 bu./ac. from the field’s entire yield, reducing profits by another $10 per acre. 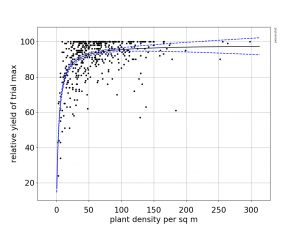 “I really think that having a target density with less than two to three plants per square foot is not reflecting the uncertainty in the density-yield relationship or the uncertainty in the estimate for emergence percentage,” Hartman says. The result of this uncertainty can be a highly variable and highly risky stand. Weed management. With fewer plants per square foot, it takes a few days longer for a crop canopy to fill in. This can mean the difference between one in-crop herbicide application per season and two. If the total cost of application is $15 and the second application is required in every second canola crop, this increases cost by $7.50 per acre of canola each year, on average. Insect risk. Consider flea beetles alone. With the same number of flea beetles spread across fewer plants in a field, there will be more beetles (and feeding) per individual plant. This damage will increase the need for a foliar spray as thresholds will be reached sooner than if the same number of flea beetles were feeding on a larger number of plants. If a lower plant density means a spray is needed two years in 10 instead of one year in 10 and the total spray cost is $15 per acre, this increases cost (and reduces profit) by $1.50 per acre per year. That may sound minor, but this aggressive flea beetle feeding could also set back crop maturity or introduce disease. A foliar insecticide to control flea beetles will also kill beneficial insects in the field, potentially increasing the need for more insecticide applications in the future. Crop staging. A lower seeding rate means fewer, bigger plants per square foot. That means more branches. Fewer branchier plants expands the flowering window, which increases the at-risk period for sclerotinia. It can also delay swath timing or straight combining while waiting for seeds on side branches to reach maturity. Some years this delay will be meaningless to profit, but in 2018 would a few days earlier maturity have made a difference to frost damage, locked-in green seed and overall harvest stress for at least a percentage of canola crops? Yes. The price difference between No.2 and No.1 could be just a few cents a bushel or $1 per bushel. The size of discount will vary by location, by month and by how much high-green canola is out there, but it is possible that high green when averaged over the years could significantly reduce revenue per acre for lower plant counts relative to the higher target. Stubble density and anchoring swaths. With just a few stems per square foot, swaths may not anchor as securely as if they were held down by many uniform stalks. Canola plants left to stand for straight-cutting can also see some effects from wind: thicker densities will knit together and the plants will be less prone to bashing against each other and dropping seed in windy conditions compared with thinner stands. This could have no affect at all some seasons, or could be a bigger issue than people realize in high-wind events. Conclusion: All things considered, Hartman says the most economic seeding rate is likely that which produces a final harvest stand of four to six plants per square foot.